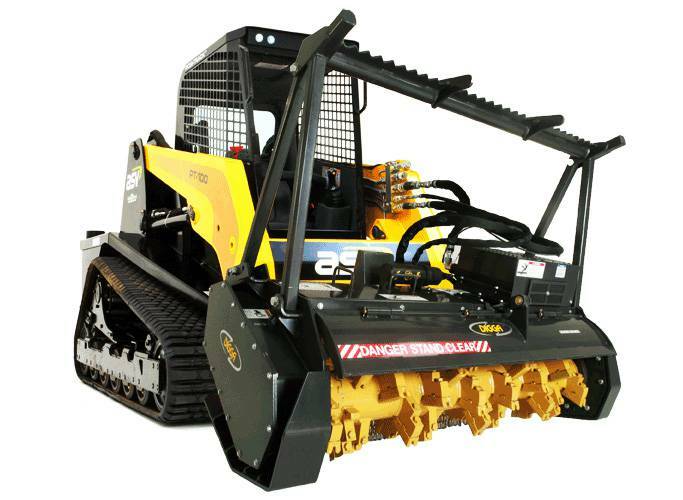 grinding small and large material, trees or brush, even above ground stumps with just one operator. Debris can be mulched back into the soil for faster decomposition. Magnum is the perfect value adding attachment for clearing firebreaks, land clearing, maintenance of park or forestry trails, vegetation management and re-mediation. Ability to adjust hydraulic motor flow to match the output of the host machine. Increases production by reducing recovery time. Increases Production by cooling hydraulic oil and virtually eliminate down time required to let machine cool down. Protects the host machines hydraulic system from damage due to constant overheating. Patented reversible split tooth design channels cut material through the centre of the teeth providing relief and consistent cut material. Reduces drag on motor increasing production. Reversible tooth allows for quick field replacement without downtime. Unique Chevron design 200HP drive belt and sprockets eliminate slippage. Eliminates the need for Tensioning devices, reduces load on Bearings. Significantly reduces down time and maintenance costs. 3/4 inch Drum wall thickness. Five reinforcing stabilizers reducing rotor flex, resulting in increased bearing life. Through shaft design adds to rigidity. New “push” type adapter sleeve traps the bearing against a shoulder on the rotor shaft which prevents the rotor to float axially in the mainframe. Guaranteed a positive grip on the rotor shaft that will never come loose in the event of a heavy shock load or an unintentional axial load. The new design also prevents dirt from making its way to the bearings. For pricing or more information about the Magnum Mulcher fill out the form and we&apos;ll be in touch soon. Alternatively call (08) 9457 1544.